For the Young brothers, shopfloor automation began by adding a bar feeder to an existing CNC turning center. This happened very soon after Gillen and Bob Young purchased Cookeville, Tennessee’s, Custom Tool in 2008. (Gillen is president; Bob is vice president.) The bar feeder, which enabled a two-axis CNC turning center to run unattended for long stretches of time during staffed days, represented a significant shift in shop culture compared to how the company was previously managed. That is, automating a manual task was never contemplated to the extent that even payroll checks were still written by hand prior to the business acquisition. Today, various automation examples have been implemented, and the 13-person shop benefits from them in various ways. For example, two new bar-fed, Y-axis turning centers with subspindles, live tooling and parts collectors can be set up to run overnight with the goal of machining parts complete while getting as much production time out the available 15.5 hours the shop is not staffed. In fact, lights-out machining accounted for 30 percent of the shop’s total production hours in 2017, and it is on pace to increase that to 45 percent this year. Shopfloor employees, many now freed from simply loading and unloading machines, are better able to consider and suggest ways that processes can be improved. Oftentimes, these helpful suggestions have related to automating existing manual tasks (such as integrating part deburring into the machining cycle). In addition, new inspection technology has automated some measurement routines for multiple parts that were machined overnight. Custom Tool also has recently automated data collection for its “production log” planning strategy it established seven years ago. The production log, which has become the backbone of its operation, reveals how effective the shop’s machines were during a day relative to expected daily production volumes, and shows how much “stolen time” the shop is pocketing. (This is the brothers’ nickname for the unstaffed 15.5 hours each evening.) It also helps identify jobs that make sense for overnight production as the shop looks to increase the percentage of annual lights-out-machining hours to 50 percent or more of its total production. As Bob says, that amount of unattended machining time equates to a second staffed shift at a much lower cost. Bob Young manages the site operations while Gillen, who also works as the chief architect IoT solutions for AT&T Consulting, is located in Atlanta, Georgia (although he visits the shop as frequently as time allows). The two decided to purchase Contour Tool after Bob, who previously worked for a machine tool distributor, was approached by the former owners who were nearing retirement and looking for an exit. It became immediately clear to the brothers that changes to the company’s culture were essential. The two began working on instilling a mindset of continuous improvement with an eye toward implementing automation as much as possible. Given some natural attrition, they hired some new people, many relatively young and inexperienced, who were more open to embracing advanced technology and more apt to suggest ways to streamline processes. After seeing the unattended-machining benefits of that first bar-fed turning center and envisioning a time when lights-out machining would become a reality, Custom Tool made a more substantial investment in 2012, adding a Y-axis Okuma LB3000 EX Spaceturn with live tooling, a subspindle and an Edge Technologies bar feeder to enable complete machining for some parts. The shop added another such machine in 2016 and a third will be delivered in January 2019. • Coolant system. Unexpected drops in coolant pressure or interrupted coolant delivery can cause tools to break. Machines that run overnight require more maintenance than those that run only one shift. So, if a booster-pump filter is typically checked every few days for a machine that runs one shift, that filter now must be checked every day. In addition, Custom Tool’s second Y-axis turning center features a controller that sends a signal to stop the machine if it detects an issue with the coolant system. • Chip conveyor. Not all chip conveyors are the same. Custom Tool’s first Y-axis turning center has a conventional unit, but the second one features a Hennig unit with teeth on the conveyor. The Young brothers say this conveyor more effectively removes long, stringy chips commonly produced when machining aluminum, so they are more likely to run aluminum jobs overnight on this machine versus the other. This eliminates chip “bird nesting,” which can interfere with the parts collection system. • Parts collection. Initially, the chip hopper also served as the parts collector. Now, each turning center has an integrated parts collector. The size of the collectors must be able to accommodate overnight production volume. If the capacity is too small, then the number of large parts that can be produced overnight is limited. In addition, coolant comes out with each part that is collected, so some means of draining the coolant out of the parts collector and back to the machine’s sump is needed. • Bar feeder. If parts for a job are sizeable, a bar feeder’s capacity might limit how many parts can be machined overnight. On the other hand, if cycle times are very fast, it is possible to consume all the loaded barstock, meaning someone would have to come to the shop to replenish the material so that overnight part production is not reduced. • Redundant tooling. The fuel fitting part with two types of threads shown in the slideshow above was the first job that Custom Tool set up to run overnight using redundant tools. When this job ran with an operator standing by, that operator could tell when an offset change might be needed due to tool wear. However, the shop found that it initially could only run that job lights-out for four hours, because it was at that point in which offset adjustments were needed for the two threading tools. Recognizing that, the shop started using redundant threading tools, calling for a tool change at a certain part count just prior to when tool wear became an issue. Although the shop does not get all the potential life out of its threading tool inserts, the additional time the machine can run unattended justifies this. • Load monitoring. None of the turning centers have broken-tool-detection devices, but they do have spindle-load-monitoring capability. When the load goes to zero, that means a tool has broken. Part programs are written so that the machine stops at that point rather than continuing to run the job and risking breaking subsequent tools. • Measurement capacity. It is nice that when hundreds of parts can be machined overnight, but that unattended production has changed what some Custom Tool shopfloor employees do to start each day. Time must be set aside for part segregation, inspection, machine evaluation and setup for the next job. In fact, part inspection became a bottleneck when the shop first implemented lights-out production. To speed inspection routines, Custom Tool added a Keyence IM series image dimension measurement system, which can automatically measure and record numerous external part features on one or more parts set up on the device. The production log Bob implemented in 2011 reveals how productive the shop’s nine CNC machines and one robotic welding cell are each day by comparing daily planned work for each with actual production achieved. It also reveals how effectively the shop is making use of the available overnight hours. Until recently, all this data has been collected manually. Each hour, employees such as Quinten Gass or Tracy Cogdell log part-production numbers hourly for each machine and enter those values as well as machine-status codes into the production log spreadsheet. The codes the shop uses for the production log are shown in Table 1 above. It strives to maximize the values of codes 10 and 15, representing production time during the shop’s single day shift and unattended production time overnight, respectively. Comparing these values with expected daily production reveals true machine utilization, Bob says. Other codes, such as those for setup, rework and time waiting for material, tooling or operator attention, shed light on precisely how long it takes to complete a job in addition to the actual machining time. The production log helps identify processes that lend themselves to lights-out operation. If a machine set up to run all night is not getting close to the 15.5 available hours, then it might be that this job is not well suited for running overnight. Or, if one machine runs all night and another runs half the night, perhaps it makes sense to push the job that ran only half the night to a different machine and replace it with work from the other, longer-running machine to achieve higher utilization. The production log also serves as a diary of sorts, because it is used to document issues such as tool breakage or bar-feeder malfunctions that caused machines to fall short of targeted production values. Soon, no one will need to visit machines each hour to collect and enter data for the production log. This is thanks to an automated data collection and reporting system Gillen is developing that uses a web-based, Industrial Internet of Things (IIoT) platform to pull data from machines that have agents for the open-source MTConnect communication protocol as well as the company’s Jobboss enterprise resource planning (ERP) software. The platform is Devicewise for Factory from Telit, a company that offers IIoT modules, software and connectivity services and software. Gillen says the benefits of this system are that it interfaces with a variety of controllers and no custom programming is needed for data collection. It is configured to automatically pull all data that was previously collected manually from the machine (part count, machine code and more) as well as ERP data (job number, job description, order date, order quantity, delivery date, etc.) and stores it in the cloud. Data is accessible via a web dashboard. Reports then can be created to more graphically show what was previously available in the production-log spreadsheet. The system has been collecting data every 20 minutes since early June 2018 without missing an entry for a machine that was running. Three turning centers and one mill are currently connected. Another mill still requires an MTConnect agent to be installed before it can be connected. Gillen says there are many good machine monitoring products available. However, his technical background afforded an opportunity to explore an in-house solution that addresses the business information the shop is most interested in knowing. He also feels this data-collection capability might also lead to even more advanced analytics, such as tying cut time to specific types of cutting tools or inserts. Custom Tool will soon investigate adding an MTConnect agent to its newest machine, a Bridgeport V480APC vertical machining center with pallet changer. This machine also represents another new automation initiative for the shop: robotic loading. Although the company has a robotic welding cell, this will be its first robot to be used for machine loading. What’s impressive is that, aside from getting advice from various sources, the shop is designing and building the robotic loading system on its own. In this case, it will be used for a dedicated job: drilling stainless steel tubes in volumes ranging to 250,000 per year. Much of the design work is being led by Clay Adcock, the company’s manufacturing manager. The goal, however, is to create another robotic loading system that could be deployed to multiple machines. The Young brothers say that the experience of designing and manufacturing the dedicated system will prove to be valuable for the more flexible system. Custom Tool works to run its bar-fed turning centers as many of the 15.5 available hours overnight that the shop isn’t staffed. Around 3 p.m. each weekday, shop personnel such as Clay Adcock and Quinten Gass begin setting up turning centers to run jobs lights-out during the evening. This fuel fitting is the first job the shop ran unattended overnight. It used redundant tools for the two threading operations to compensate for tool wear and double the number of parts that could be machined lights-out. Also, since this photo was taken, the shop has started using a special tool to perform in-cycle deburring to eliminate a secondary, manual deburring operation. It is important to consider chip management when developing a lights-out machining process. This unit features conveyor teeth that enable it to better handle long, stringy aluminum chips when the turning center runs unattended overnight. Lights-out machining means a lot of parts are waiting for shop personnel when they arrive in the morning. For Custom Tool, this created an inspection bottleneck that spurred the shop to add an image dimension measurement device to speed part measurement for quality control personnel. For now, Custom Tool personnel such as Quinten Gass still visit some machines hourly to collect data to populate the shop’s production log. This will be unnecessary once all machines are linked to its new web-based, automated data-collecting system. The automated data-gathering system collects production information from machines every 20 minutes. It also pulls job data from the shop’s ERP software. Reports can then be created to more graphically show production log information. 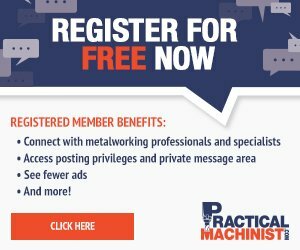 Click Here for a free subscription to Modern Machine Shop magazine. Click Here to subscribe to the MMS Extra monthly e-newsletter. This article is reprinted with permission from Modern Machine Shop Magazine, and is protected under U.S. and international copyright laws. Modern Machine Shop Magazine is protected under U.S. and international copyright laws. Before reproducing anything from this Web site, call Gardner Business Media, Inc. (513) 527-8800.